"Griffin Letter, 1945 July 01" by John T. Griffin Pt. Griffin writes to Mrs. Davis about his time with Bob (Davis) and says that he is doing well.Griffin mentions that some men are leaving his regiment and going to the 500th, he is sorry to see them go. He informs Mrs. Davis that Bob (Davis) has good living conditions and says his farewells. % Pm. 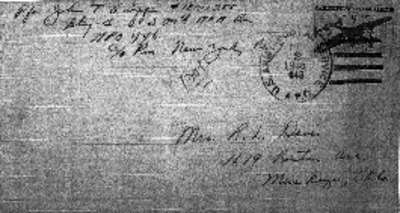 New York, N. Y.
U. S. ARMY POSTAL SERVICE A. P. O.
I suppose that you have received the joint note from Ingolstadt that Bob and I wrote. If so you will already know that we finally managed that European meeting 5 or 6000 miles from home. I have never seen Bob looking any better and he has a job that he enjoys very much. You would be very proud of him for I was impressed from the very first that he was me of the most important men in his unit. It seems to me that he and me after fellow did nearly everything. More than any of the officers by far. The officers I rode up with told me the same thing. I told Bob and will repeat to you that I think he is in his natural orbit. I got to Ingolstadt last Tuesday night and came back Saturday morn. We had a good long stay together and it was about perfect. Yesterday I came back to a sad unit. Ride playment that had missed us up to now had hit at last. Not many men this time and it may be a long time before they got us all but it signals the heading up of the 500th. Combat binds friends together pretty close and I was am sure sorry to see the boys go. Any way there is the of knowing we did an job well. I neglected to mention that Bob has very good living conditions. In fact about the best I have ever seen in the army. I must close now Mrs. Davis. I have a million letters to write and plenty of odds and ends to clean up.